Season nine of The Walking Dead has dropped a lot of bombshells on its viewers. Like, the "death" of leading man Rick Grimes, and that whole six-year time jump. Though a lot of things have changed within the series' established communities, there's plenty of familiar faces around to keep fans happy. But one character in particular has been notably absent, leaving fans to wonder, "Where is Maggie Rhee?" While characters like Rick and Paul "Jesus" Rovia have had very dramatic exits from the show, Maggie's departure has been a lot more subtle and open-ended. The last time we see the former leader of Hilltop is in the first half of season nine, the very episode in which we witness Rick's "death." She spends most of the episode enacting a plot to kill Negan for murdering Glenn, but when she finally faces him in his prison, she decides to let him rot in his cell, instead. Soon after, she's one of the many witnesses to Rick blowing up the bridge in an attempt to stop the walkers from invading any of the communities and has to hold back a grieving Michonne from rushing into the wreckage. That's the last time we ever see Maggie, but it isn't the last time she's mentioned. Season nine's fifth episode, "Who Are You Now," explains that Maggie packed up little Hershel and went to join Georgie's camp. It explains why Jesus is left to handle Hilltop in her stead, while leaving room for Maggie to make a return should Lauren Cohan ever decide to come back to the show. Cohan announced that she was leaving The Walking Dead after officially signing on to star in ABC's new dramedy, Whiskey Cavalier. While Cohan currently has no confirmed plans to return to the zombie drama in the upcoming tenth season, she has revealed that there have been "conversations" about a Walking Dead spinoff built around Maggie. "There may have been some conversations but everything is so early days ambiguous," Cohan disclosed at the TCA's winter press tour on Feb. 5. "We'll have to see what happens." We could totally see a Maggie spinoff working, though we could also see the character appearing in one of the three feature-length Walking Dead films that Andrew Lincoln signed on for after his departure. Since season 10 will also be Danai Gurira's final season as Michonne, perhaps the two will work out their differences and Maggie will convince the mother of two to join her in Georgie's new community? 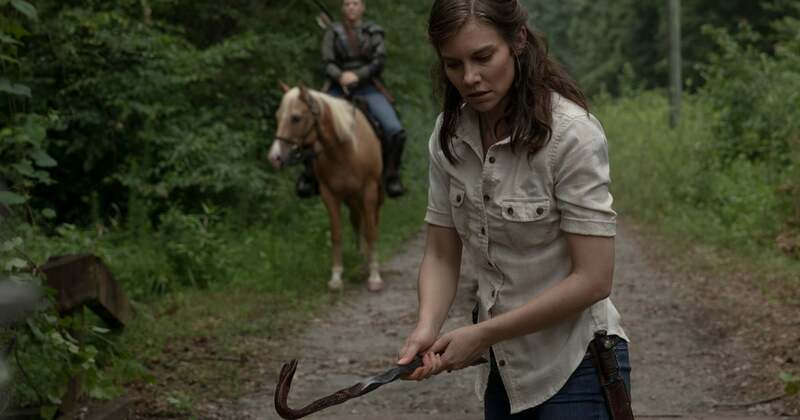 Either way, we have no doubt that fans would love to see Cohan bring back Maggie's badassery, even if it's only for a few episodes.